I really, really need to start writing out my Christmas cards. A couple of years ago, I found a few boxes of Christmas cards illustrated by Holly Hobbie to send out. I love her adorable illustrations and all of her books. This Christmas, though, it looks like I could use Puddle's help (from the Toot & Puddle picture books) to get my cards out in time! In Toot & Puddle: I'll Be Home for Christmas , Puddle is home in Woodcock Pocket trying to prepare for Christmas without Toot. Christmas is only a couple days away and poor Toot's flight home is delayed in Edinburgh because of an ice storm. Puddle writes out the Christmas cards but can't mail them without Toot's signature. He bakes and brings home a Christmas tree, all the while worrying that Toot won't make it home for Christmas. When Toot's flight finally lands, heavy snows make it nearly impossible to find his way home...that is until a lucky nut and a mysterious stranger help save the day. As always, Holly Hobbie's watercolor illustrations steal the show. The winter snow scene pictures help set the holiday mood perfectly. I also adore the large, two-page airplane illustration where Toot is singing Jingle Bells. The back of the paperback book includes two punch-out Toot & Puddle ornaments to hang on your tree. Toot & Puddle fans will surely enjoy this book as well as all preschoolers though early grade school readers. This large-size, paperback reprint edition is printed on quality paper and would make an excellent holiday gift! As a side note, if you are lucky enough to get the Noggin Channel, they started airing a new original animated series starring Toot & Puddle in November. Toot & Puddle follows a pair of best friends who travel the world and find adventure wherever they go. Tune in Sunday, 12/14/08 for "I'll Be Home for Christmas" @ 7PM ET. Win your own paperback copy! Little, Brown Books for Young Readers has kindly offered to sponsor a giveaway. 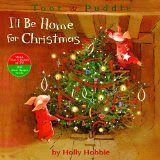 Five (5) winners will receive a copy of Toot & Puddle: I'll Be Home for Christmas . To enter, let me know the title of your favorite Christmas or snow related children's book in the comment section. • Contest ends on Tuesday, December 16, 2008 at 11:59 PM CST. 3rd extra entry: Follow me on twitter and tweet about the contest. My girls and I actually got this book out from the library the other day, and I was going to post my review shortly. LOL Great minds! My review will be a bit different from yours though as we didn't care for it. I thought the illustrations were nice, but the story fell flat for me. Wow; great giveaway! My favorite children's Christmas book is The Littlest Angel. What a fun story. I'm sure children of all ages (that includes adults!) would love readimg this Christmas story. The night before Christmas is my favorite! Our favorite Christmas book is "The Littlest Angel". Love it!! My daughter and I LOVE to read The Snowy Day by Ezra Jack Keats together. We enjoy the simple adventures and can relate to the disappointments of not being old enough to play with the big kids and of finding that a snowball will not last once placed in a pocket. I would love Toot and Pudddle (as would the kids). My favorite Christmas book is the Polar Express. I finally read the actual Polar Express book this year to my kids, and we loved it. I believe it's a new favorite. :) Thanks for the giveaway (it looks LOVEly)! A little-known book called "Mr. Gonopolis and his 12 Holsteins" has been a christmas tradition for me for many years. My girls are a big fan of the Little Critter books so they really enjoy Mercer Mayer version of Night before Christmas! My older daughter really likes The Greatest Christmas Pageant ever! I love Dr. Seuss "How the Grinch Stole Christmas." Thanks! also dr suess how the grinch stole christmas. who doesnt like that book!!? Let's see...my girls and I really like the Santa Mouse book. Last year for homeschool we read Snowflake Bentley. I found it FASCINATING! It quickly became one of my favorite books! My favorite story is How the Grinch Stole Christmas...a classic! We love the Polar Express and after they saw the movie this became a nightly staple. It would be wonderful to add another book to our Christmas library. mine would have to be the Snowman- no talking in the movie and now words in the book but so powerful! Our favorite Christmas book has to be The Gift Bearer! Great story & illustrations... Polar Express comes in at a close second! Mr. Willowby's Christmas Tree is a favorite! How the Grinch Stole Christmas is definitely one of our favorites! The Winter Cat is one of our favorites. The illustrations are stunning! i just love cranberry christmas, a followup to cranberry thanksgiving. it is adorable!! thanks for this great giveaway - we love toot and puddle! We love to read a book called Christmas is Coming, with four different stories. It gets us in the Christmas spirit every time! Our favorite Christmas book right now is Corduroy's Christmas Surprise. The Toot & Puddle book sounds adorable! Thanks for the chance to enter! We have to many favorites at my house. My daughter adores books. I would say Amelia Bedila Goes Camping is a big one in our family though. My favorite is The Polar Express. Every year we make a big deal out of hearing the bell. I just love it! The Night before Christmas was, is and always shall be my favorite. I like the Charlie Brown's Christmas! Thanks! My favorite Christmas book is the Polar Express. My kids love TOOT & PUDDLE books. They are so cute! Our favorite book is The True Meaning of Christmas. We love The Twelve Days of Christmas popup by Robert Sabuda. My favorite is Snow Day by Ezra Jack Keats. Love the pictures! Our current favorite is Snow Day by Patricia Larkin. I really like the Eloise Christmas book. She's so sassy. I love the book "Silver Packages" about a young boy from the Appalachian Mountains. My children's favorite Christmas book is The Polar Express by Chris Van Allsburg. They movie is excellent too. I'd love to win this book and share it with my kids! My favorite was always "How the Grinch Stole Christmas" and has become my daughters favorite too! Happy Holiday's and thanks for the giveaway! I love The Crippled lamb. The lamb's name is Joshua - just like my youngest son! My favorite is "Bear Stays Up for Christmas". Thanks for the great giveaway! I always loved reading Frosty the snowman to my kids when they were really little, that's my favorite.